The smooth face of the earthen dam spans the gap between two flat-topped mesas a half-mile distant, the mesas pockmarked with snow on their northerly aspects. From the bottom of the dam issues the river, flowing in a series of braids and riffles that then come together to form a fishing hole the size of Texas. The river reflects metallic beneath an overcast sky, and in the early light of a cold Sabbath morn, the faithful are gathering. 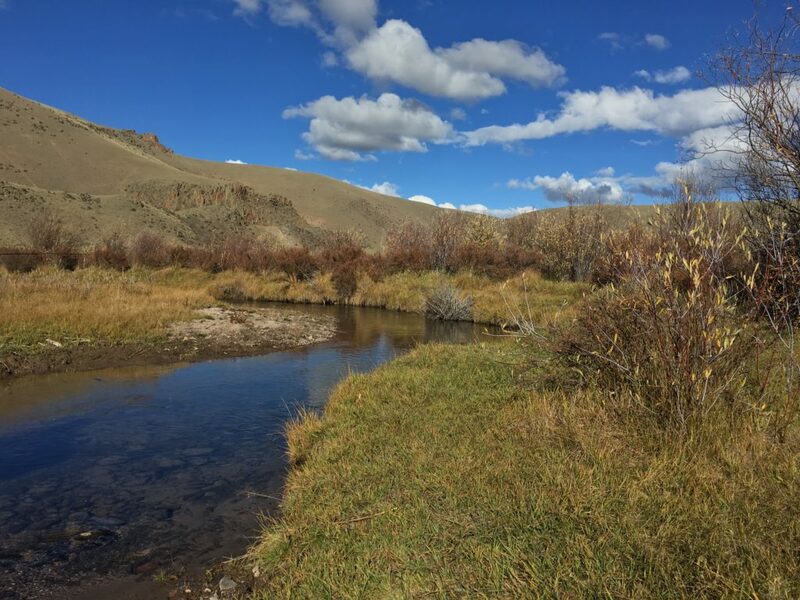 Among the patchwork of tussock lining the bank one angler sits cross-legged, contemplating the intricacies of tying knots with cold fingertips and translucent tippet. Next to his rod on the ground rests a generous pack – it seems he has few other plans for the day save what lies immediately before him. Already in the water, an angler works the vee between two braids, standing upstream of the confluence and nymphing tight and close into the turbulent water below him. He moves with the sure-footedness and animation of youth, changing his position in the river without aid of a wading staff or need to look where next to plant his feet. Suddenly his rod tip bows. He lets out a stifled victory yell then, angling his rod toward shore, splashes his way across the braid into calm water, where he proceeds to play the fish until it fills his net. With a fist pump he kneels in the shallows, gently removing the hook and line from fish and net before scooping a gentle hand under his catch and releasing it back to the river. A man and two women, clad in waders, beanies, and jackets, and each clutching a child and fly rod, emerge from a clump of willows onto the rocky shore of one of the braids where they stand, taking in the scene. A ubiquitous yellow lab follows them, tail high and tongue lolling. After a couple of minutes discussion, they decide to cross the braid to the same calm water and small beach where the young angler still kneels, checking his line for abrasions. Halfway across the braid, one of the women, an infant strapped to her chest in a carrier, slips on the slick rock and falls backward, half sitting, half kneeling in the flow, which threatens to sweep her off her feet. The man quickly passes his rod to the second woman then reaches to grab the first. For perhaps thirty seconds they teeter mid stream before the woman regains her balance and stands, infant dry, and they complete the crossing. Oblivious to the predicament of the family, the young angler looks up from checking his line to see another fisherman, having watched him land his fish, and displaying little awareness and less understanding of etiquette, taking advantage of his absence to wade across and stand right where the young angler had until recently been casting. This interloper quickly unstrings his rod and begins to cast, with much enthusiasm but little apparent technique. The young angler shrugs, and turns to speak with the family. While the interloper froths the water, a lesson is taking place on the far bank. One fisherman, beanpole straight, instructs his diminutive sidekick on the intricacies of the tension cast, letting the fly rig drift down below him then flicking it upstream again with an economy of movement. The taller one bends in an exaggerated stoop as he intently stares after the indicator as it floats downstream. The diminutive one then tries, tentatively but with a look of earnest concentration. “I’m ready,” says Caveman from the bow of the boat, where for the last several minutes he has been contemplating a series of knots of his own. I sit up straight in the seat and haul on the anchor rope. 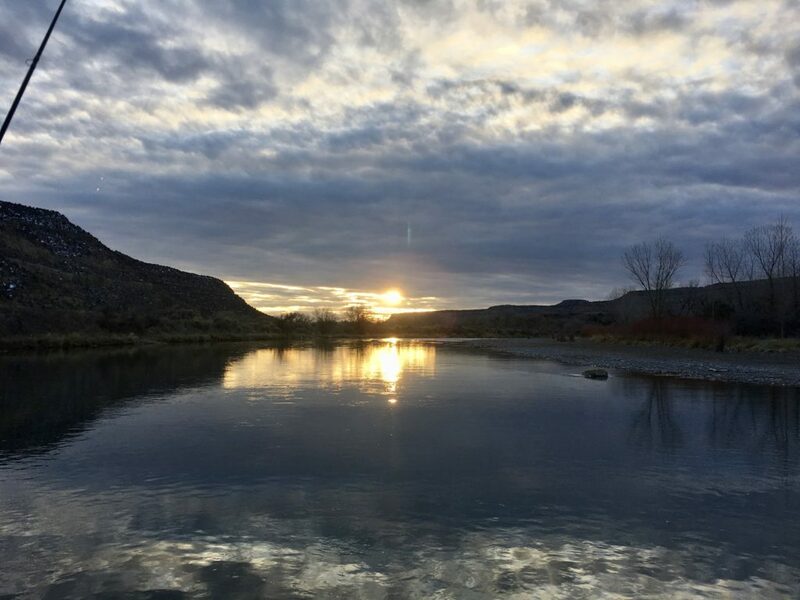 Several more anglers arrive on the far shore as I ease the boat back out into the flow, to join the faithful on a cold Sabbath morn where four braids of the river come together to form a hole the size of Texas. The tires rolling across fresh snow made a muffled chirp, reminiscent of the soft trill of a flock of grebes, floating on a northern California lake. I thought of that lake, of that most recent summer, and of how quickly the seasons themselves roll, one seamlessly into the other. 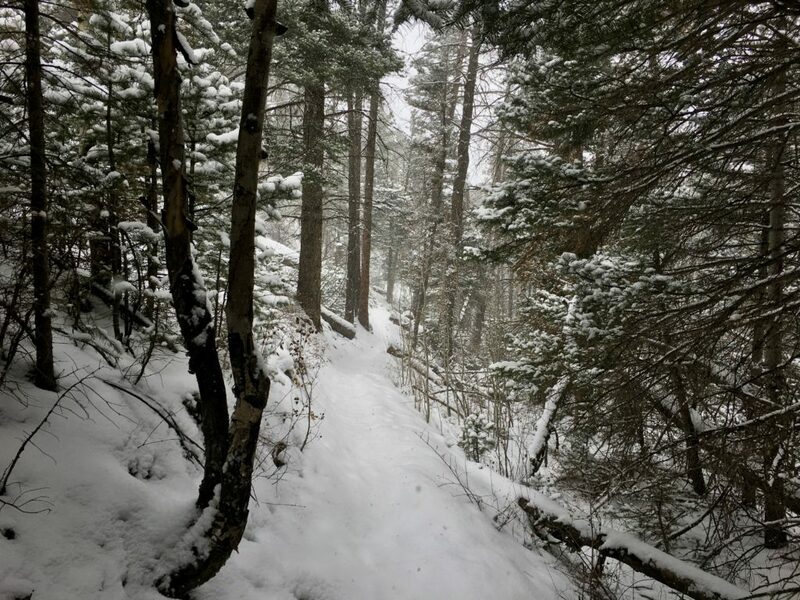 The gradient of the two-track became steeper as it wound up the tapering valley, into the clouds that ghosted through the pines, their tendrils trailing like wispy fingers through the boughs. On a steeper pitch my rear tire spun out on a patch of ice, unseen beneath the mantle of fresh falling snow, forcing me to dismount. I laid my bike down and took the water bottle from its cage. The valve had long since frozen shut, necessitating unscrewing the top. I drank a few sips then stood, and listened. No sound, save the soft murmur of the stream that ran next to the road. Somewhere close a tree creaked against its neighbor, creaked powerlessly against the inevitable. Nothing really dies, I thought, that same tree composed of elements present at the very creation of time. A soft breeze sighed through the trees. The snow eddied and swirled. The forest stood silent and stoic, indifferent to its beauty. My back began to feel the chill as my sweat cooled. I realized I needed to keep moving up hill, toward the trail. 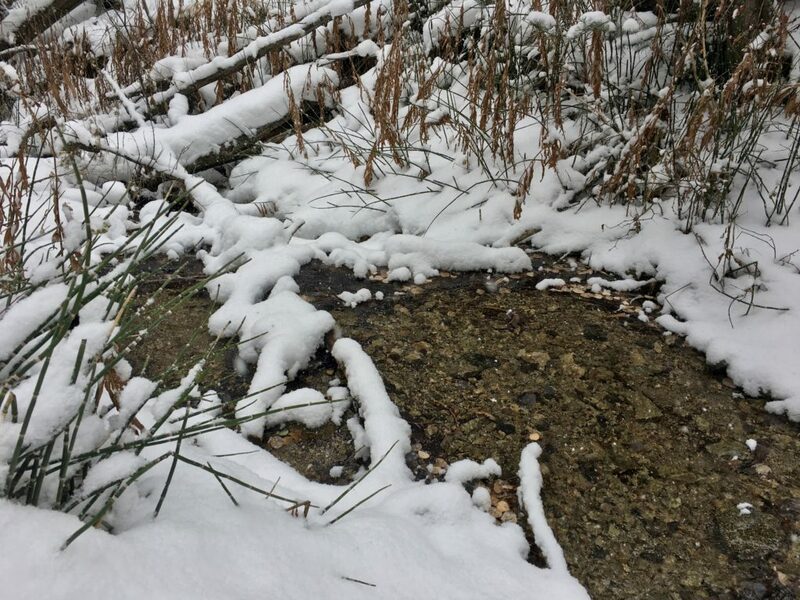 I came to a stream, frozen over, and picked my way across, gingerly from snow-covered rock to snow-covered rock, using my bike as a crutch, the sound of the water gurgling from beneath the opaque veneer of ice. At the trailhead, I leaned my bike against a fallen log, placed hands on knees and gasped for air, trying to restore the equilibrium between my muscles’ demand for oxygen and my lungs’ ability to deliver it. Taking a chocolate bar from my pocket, I bit off a chunk, thinking one mouthful would suffice, underestimating the craving for calories and sugar that physical exertion in a cold climate creates. Next thing, the wrapper lay crumpled, empty in my hand. My stomach, like a dry sponge, soaked the sustenance. I shivered. Time to move on. The trail formed a thin ribbon through the forest, laid up and down according to the contour of the land. I rounded a blind corner where, years previous, an early-morning encounter with a bear had given me an appreciation of the speed with which such animals can move, and the role blind luck plays in survival. On the dryer, south facing slopes, dense pine gave way to stands of scrub oak, their rust-colored leaves hanging limp, awaiting the next breeze to shake them loose and settle them to their final rest. For several miles the trail so wound. Fallen trees criss-crossed a frigid stream, the snow gathering on their topsides standing out like searchlights in the gloom. Finally I reached a junction in the trail and turned downhill toward home, gravity now my friend. Here the trail was less well defined, the snow concealing its landmarks. I followed it in part by instinct, in part recalling its course from those seasons when it is laid bare on the forest floor. 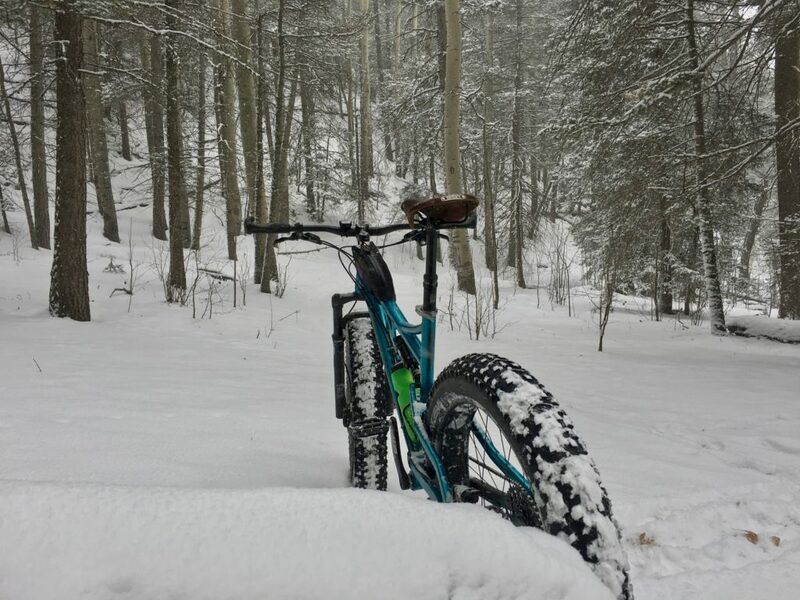 Not another soul around, the soft hiss of the bike’s tires on fresh flakes my only company. The snow began to pick up its intensity, and soon my tracks would be covered over, and once they were gone, had I really even passed this way at all? Traveling thirty miles down a gravel road generally rewards one with a degree of solitude. So it proved as we crested the final ridge and dropped down into the valley to find the little campground free of habitation, human at least. From up high the serpentine course of the stream could be traced by the stands of leafless willow that grew in clusters along its banks. 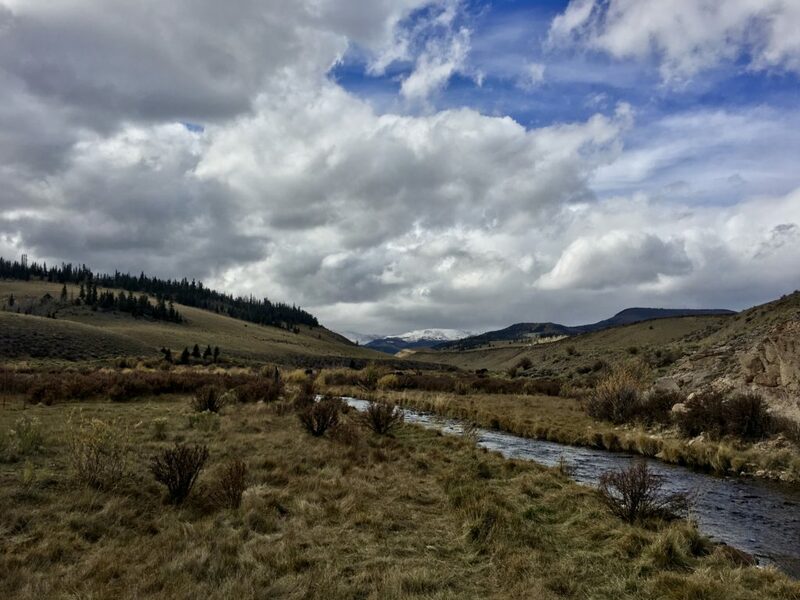 The valley narrowed upstream to the west before elbowing south, where the peaks of distant mountains, dusted with the season’s first snow, mingled with sullen storm clouds. Ostensibly we’d come to fish the stream, but for me the next few days would be as much about drinking hot tea in the silence of early morning while the sun slowly worked its way down the mountainsides to an icy camp. 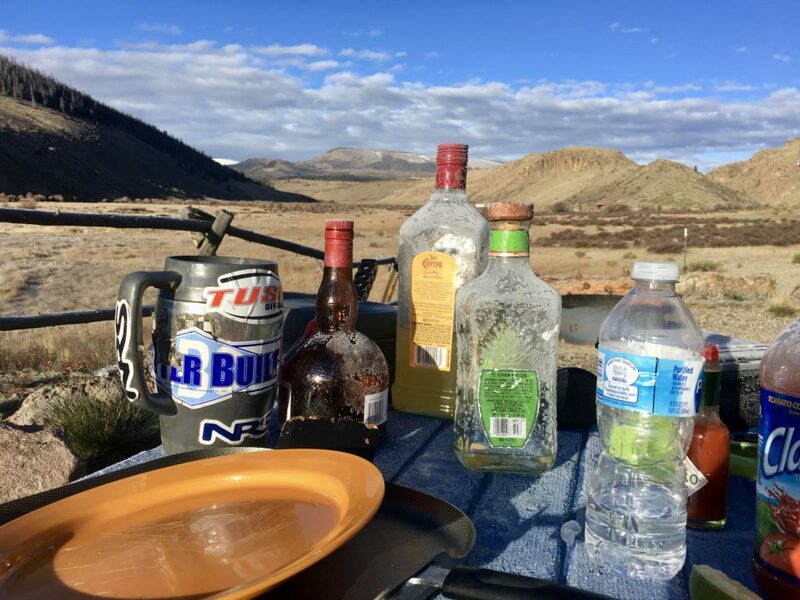 It would be as much about the aroma of bacon quietly sizzling on the griddle, of a lunch-time beer sipped with feet dangling in the stream, of margaritas and the Milky Way, and of being in a place where a cell phone is as relevant to an angler as a bicycle to a brook trout. It would be about burrowing deep into a warm bag on a frigid night, of the howl of a distant coyote and the purl of the stream overlaying it all. We set up camp on a small ledge that offered a pathway down through the rocks to the meadow and stream below. From this vantage point we could observe a portion of the stream—a slow, elongated pool that quickened into a riffle and turned down-valley at the foot of the ledge. After dunking my dried-out wading boots in the water to soften the leather, I returned up the path to the ledge and sat, taking pleasure in the ritual of donning waders, cinching boots, choosing a rod, freshening tippet, and sifting through my fly box even though, in my mind, I’d decided three days ago which fly I would start out with. The sight of a fish rising in the pool below, intermittently but with the persistence of an active feeder, heightened the anticipation. I pulled my attention from the pool to upstream. For at least a mile it zig-zagged its course before the valley dog-legged out of sight toward the mountains to the south, the pull of what lay beyond growing stronger by the minute. I rummaged through the food cooler, stuffing some cheese and crackers and a couple of energy bars into one of the pockets of my hip pack. I guessed the time as close to noon, and didn’t expect we’d return to camp until after the sun had dipped below the horizon. By then, I knew, my lower back would be aching gently from walking several miles over uneven ground, my legs would be weary, my best friends Advil, my camp chair, and margarita cup. He stood, slipped on his fly vest, and grabbed his rod. As lakes go it is not particularly impressive, rather an elongated pond with an inflow at one end and an outflow at the other feeding a small power station further downstream. Getting there takes little effort, the noise from the highway a half mile distant occasionally audible when the breeze isn’t just so, softly sighing through the pines. 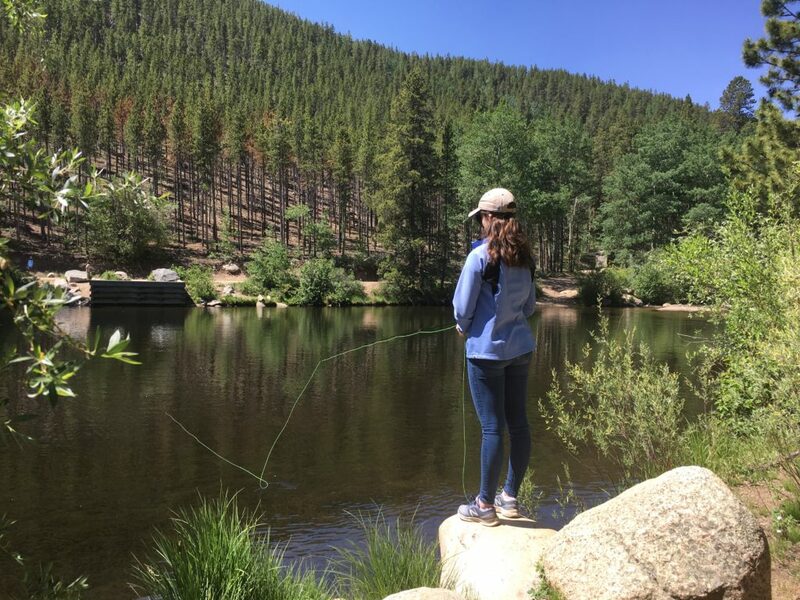 Yet it is a lake that holds special memories, of one daughter catching her first fish, and the other her most in one day. Forty five minutes later we stood in the morning sun on the rocks along the foreshore. 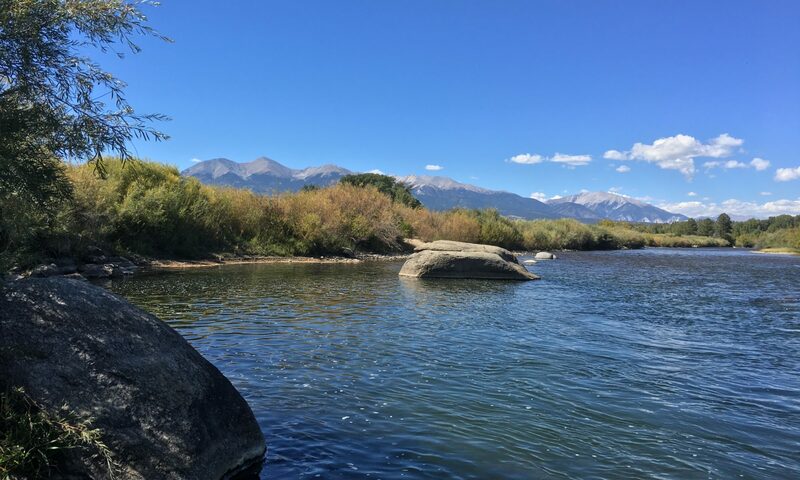 Patches of weed dotted the lakebed along the shallows, and fish circled in lazy, elongated beats, foraging into the gentle current from the inflow, then circling back toward the outflow before resuming their quest toward the inflow again. A thin film of pollen lay on the surface, and occasionally a fish would rise up and sip a morsel from just beneath this film, dimpling the surface but not breaking through it. Bushes and taller pines grew right to the water’s edge, and I reminded her to keep her back cast high to avoid snagging her line. For the next hour the fish remained aloof, like a Parisian shopkeeper feigning ignorance of the English language. For the most part they completely ignored our offerings, occasionally swimming vaguely toward the fly as if to feign interest before turning away again. Two women walked along the far shore toward the trailhead beyond the lake, their dog sniffing the undergrowth along the way. A Jeep drove up to the parking lot, then turned and disappeared back down the road, the occupants evidently unsatisfied with what they saw. An intermittent breeze blew across the lake, ruffling the surface. In the center at the deepest part, a bright orange bobber floated, impervious to both wind and current. Finally, success. Tying on a fresh nymph behind my dry fly, I cast it out and watched as it sank in the clear water, settling suspended a few inches from the bottom. A passing fish turned to inspect it. I watched as it next opened its mouth. The fly disappeared, and as the fish turned away I gently raised the rod tip, setting the hook. “Cheeseburger?” she inquired as I selected a particularly gaudy dry fly. She cast out once more. A fish rose off to the right. 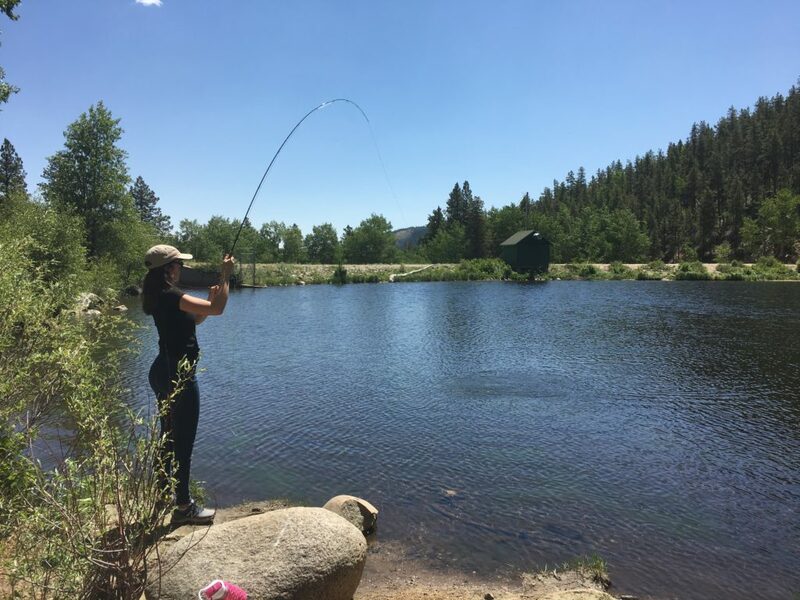 The fly disappeared in a boil and she set the hook, holding the rod high while stripping the line. A couple of minutes later she released a lovely rainbow. “What time is it?” she asked, smiling. I cut off our respective flies and we reeled in our lines. I had to nod agreement. 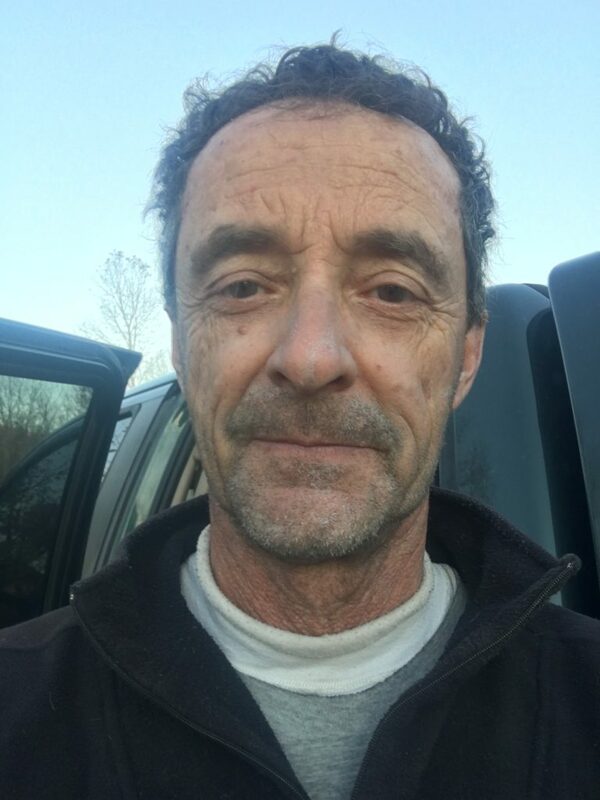 Ever since society evolved to the requisite level of sophistication where someone could call themselves a fishing guide without being laughed out of the village, and someone else accumulated sufficient goats and grain to trade some for a day on the river, questions revolving around tipping have plagued and tormented anglers. How much is enough? How much is too much? Is it too big? Is it too small? Will my guide curse my name, laughing at my inadequacy as soon as I leave the parking lot? Should I have saved some cash for my wife’s birthday instead of unloading my wallet like that? Years of guiding have helped me develop a foolproof ten-step formula that will leave your guide happy, your ego intact, and hopefully also leave you with enough money left over for a dozen roses for your Better Half’s big day. *A little steep, I hear you ask, for merely turning up, somewhat disheveled and a little abrupt? Think again. After all, with guides we are not dealing with normal accepted standards of hygiene, grooming and etiquette. And who knows? Maybe one day some of that $50 might make it past the liquor store to be spent on a razor and soap. Would you tip this man? 3: Your preferred method of dealing with every tangle it is to shake your rod vigorously in the misguided expectation that the two weighted nymphs, split shot and indicator will remarkably untangle themselves. Realizing that your rig has now come to resemble a tennis-ball sized cluster of rigging tightly fastened to the end of your rod, you hand it off to your guide, saying “Huh, looks like I tangled again.” Add $50. 4: Your buddy tangles. Your guide eases the boat to shore beneath the shade of an overhanging cottonwood to help your buddy, but you just can’t stop casting. 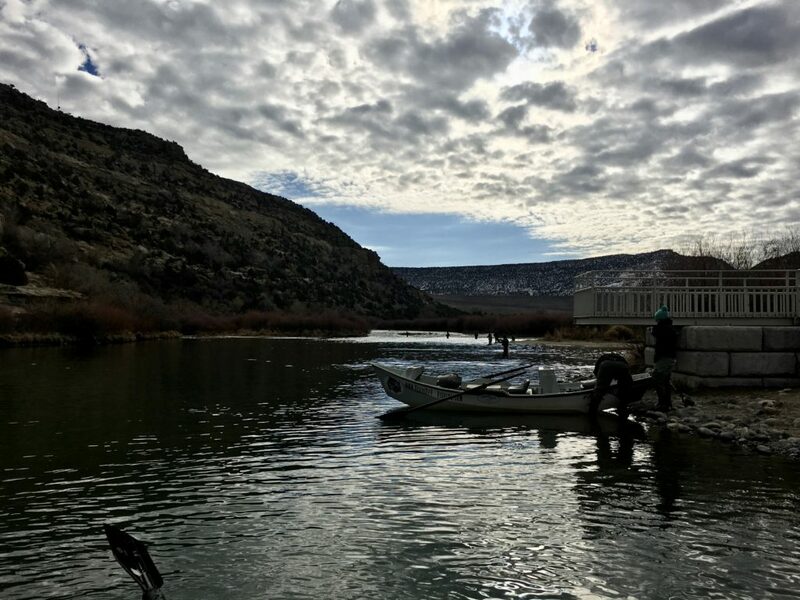 You turn in your seat and, despite the fact that every guide you have ever fished with has told you fishing the middle of the river is a waste of time, especially river you have just drifted over, you decide ‘What the heck’ and cast one out there. Except, the flies never make it to the water. That’s because they are stuck twenty feet high in the cottonwood you are sitting under, whose overhanging branches are tickling the back of your neck. Add $50. 5: You think that dropping your backcast every now and then and putting a cone head woolly bugger into the side of your guide’s head is just one of his or her occupational hazards. Add $50. 6: You bring beer. Subtract $20. 7: Your idea of beer is Coors Light. Add $20.